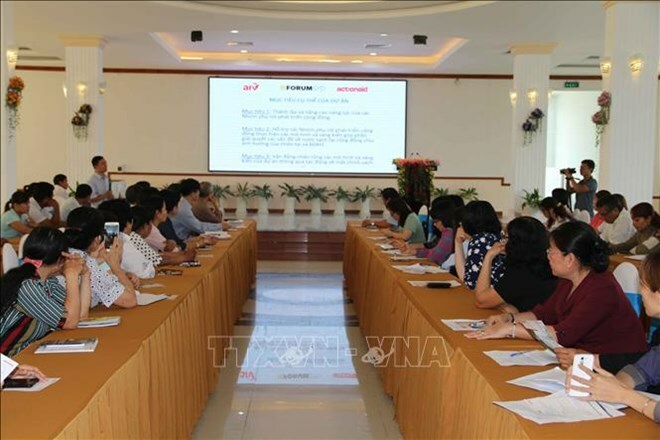 Tra Vinh (VNA) – The ActionAid Vietnam (AAV) and the People’s Committee of southern Tra Vinh province held a local conference on March 22 to discuss the project “Women respond to natural disasters and climate change”. The project is underway in Wards 8 and 9 in Long Duc commune, Tra Vinh city, from January 2019 – June 2020, costing a total of 4.9 billion VND (213,000 USD) funded by the Sweden’s Forum Syd and ActionAid Sweden. It aims to help women in areas affected by natural disasters and climate change and raise their awareness of climate change adaptation and disaster risk management, towards building resilient communities and improving their access to public services on water drainage via policy dialogue. Its activities include promoting water purification using solar power, multiplying effective models via policy impact, among others. Vice Chairwoman of the municipal People’s Committee Tang Thi Dep said Tra Vinh province and Tra Vinh city in particular is one of the Mekong Delta localities hardest hit by climate change, particularly drought, rising sea level and salinisation. As a member of the ActionAid International, the AAV has carried out development programmes in Vietnam’s poorest and most remote areas since 1989. Its activities aim to raise public voice to ensure the rights of the poor and the disadvantaged, improve the role of the government and other relevant parties in programmes directly affecting local lives. Founded in 1995, Forum Syd is a politically and religiously unaffiliated development cooperation organisation with around 140 member organisations from Swedish civil society.